Taking the 6:56 train to college in Dublin from where I live, each week during my MFA course, made me aware of the lack of communication that now exists among travelers. Where once conversations developed with the passenger beside you, now all you hear is the muffled noise coming from your fellow passenger’s earphones. These fellow travelers are physically with you on a high spec train, racing through the country side to their destination, yet they are, in fact, somewhere completely different. No one speaks, no one is aware, everyone is caught up in their own, technical world. 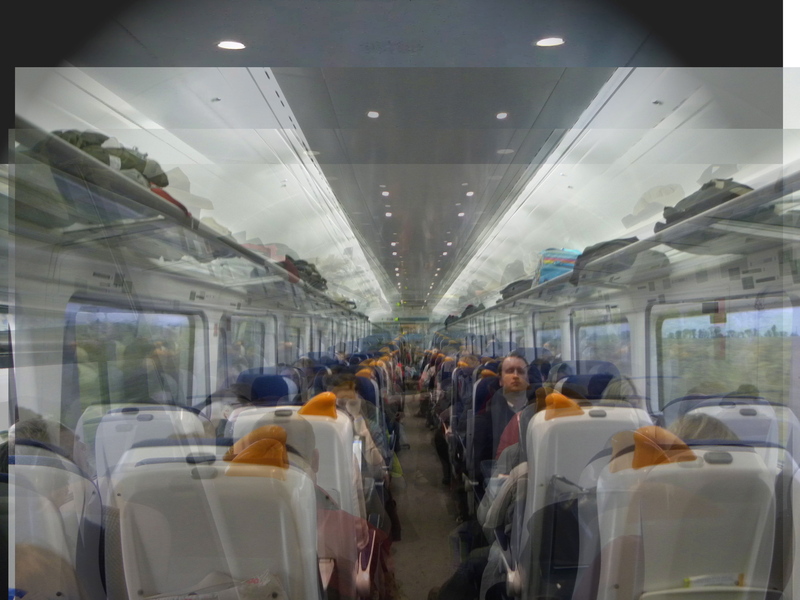 ‘The 6:56 to Dublin’ is an installation comprising of a still photograph and three, separate sound tracks on independent headphones. Depending on the headphone you put on, what you hear is different to what the person beside you hears. (A) This precise train specification manual read out in a steady, man’s voice. (B) A cacophony of voices singing songs, one overlapping the other. All are slightly out of tune as this is what people sound like when they sing along to a song with headphones on. (C) ‘The Express’ written by Stephen Spender (1909-95), recited by a young woman. ‘The Express’ is a modern Romantic poem glorifying the Express train in motion, which can be regarded as a symbol of industrial revolution.